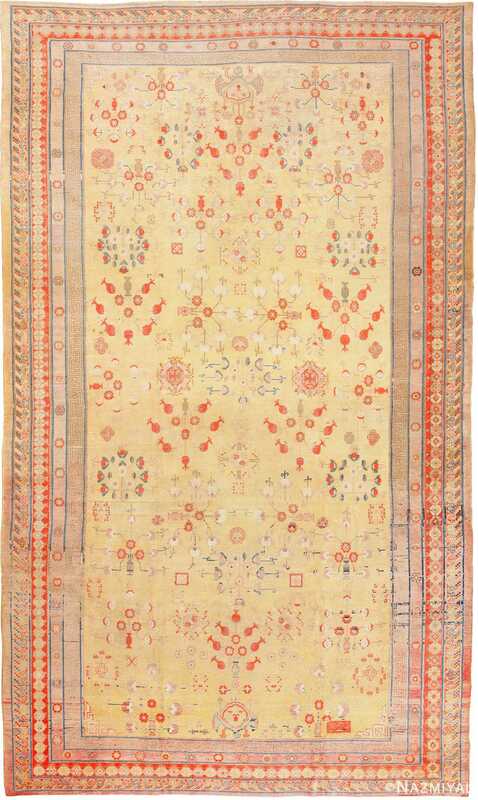 Rare and Beautiful Large Oversized Antique Khotan Carpet, Country of Origin: East Turkestan, Circa Date: 1910 – This breathtaking, large antique Khotan carpet is an intricately detailed, balanced piece. 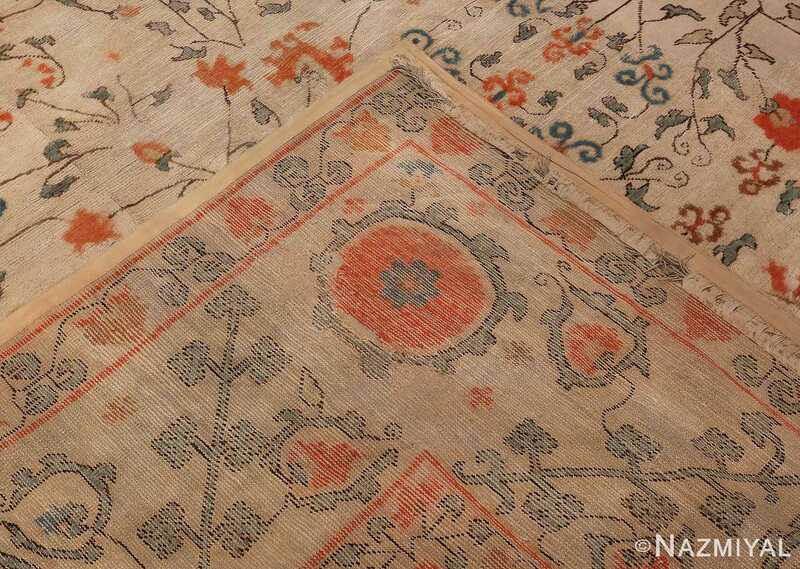 Spread across a backdrop of cream, this fascinating antique carpet features a flourish of botanical beauties. 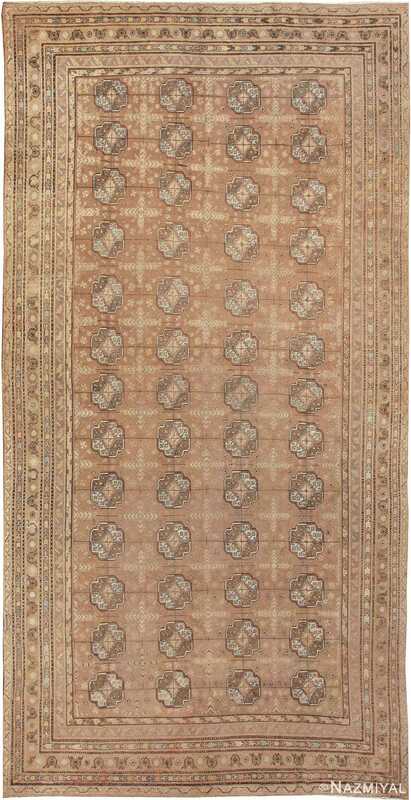 The overall composition of the rug design is reminiscent of the antique textiles from Uzbekistan. 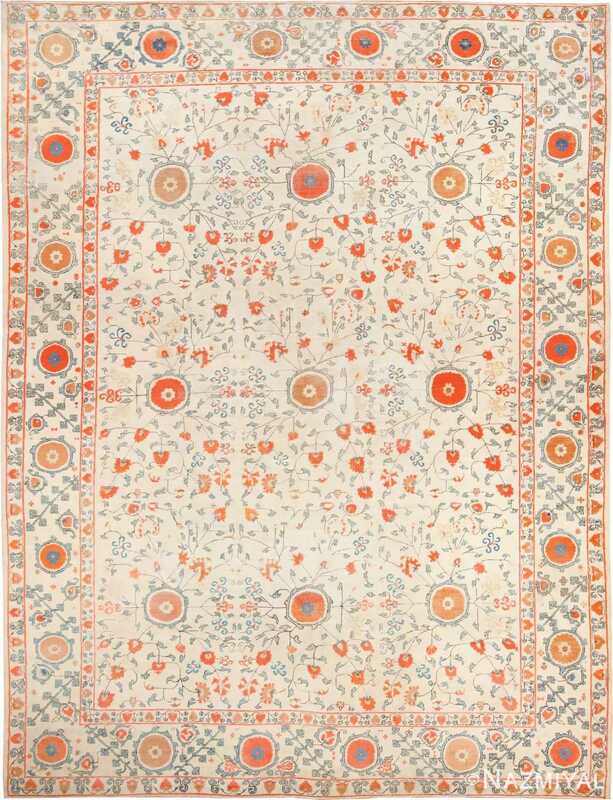 This leads us to believe that someone probably saw a smaller antique Suzani and had this oversized rug fashioned based on that design. The large orange emblems pop with vigor and vitality against the white ivory background. 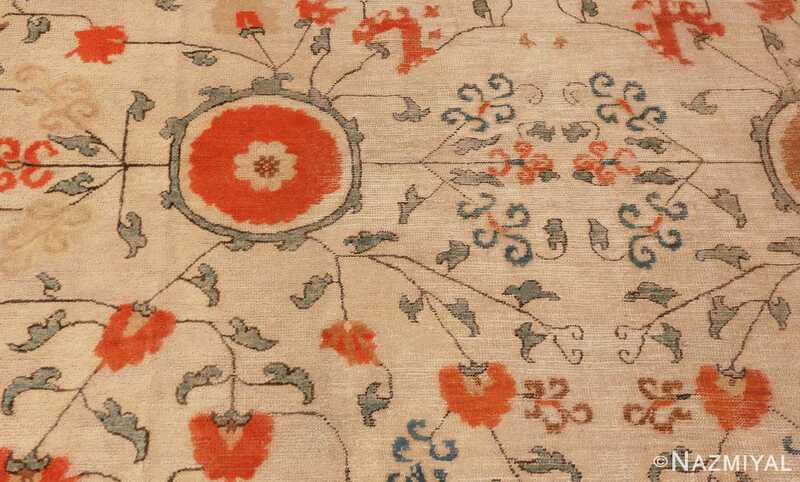 These large emblems are surrounded by their smaller, yet significant, floral counterparts – orange little flowers that look as if they’ve been touched by a summer morning. 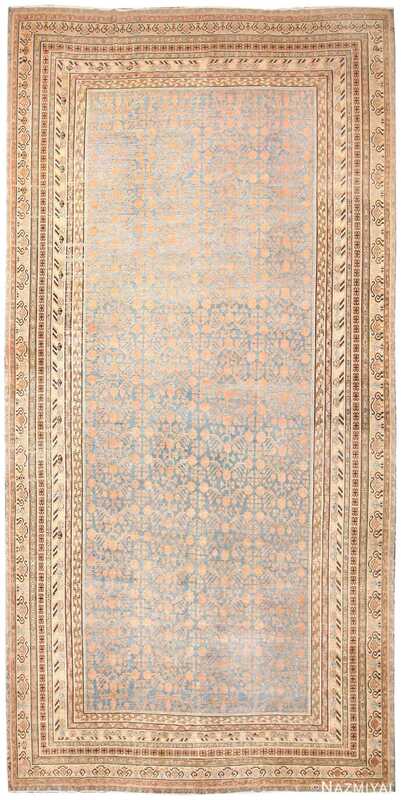 This magnificent large oversized antique Khotan carpet features beautiful light blue colored vine scrolls and thin brown interconnecting branches. These branches vine scrolls add a true sense of movement and an overall cohesive to the design. While this antique Oriental rug was woven over a hundred years ago, it gives off a feeling that is quite modern and contemporary. 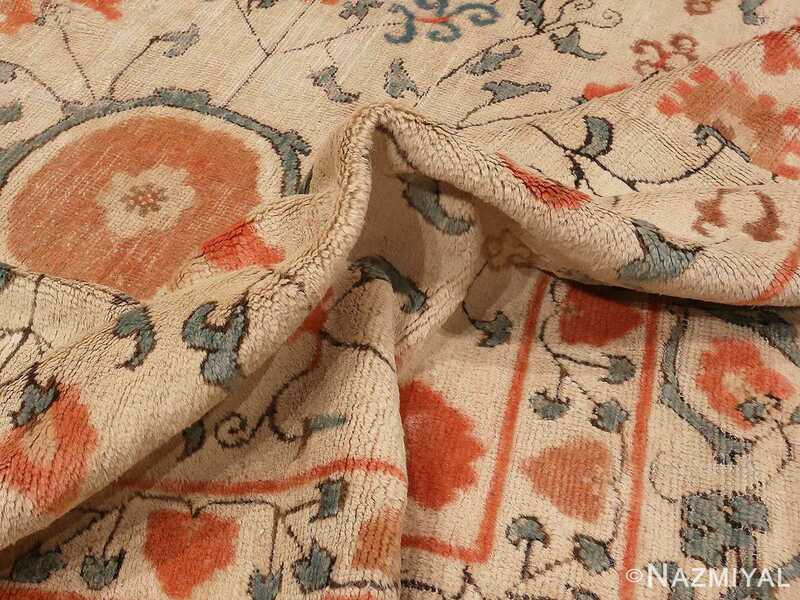 That is a sign of its timeless beauty and the skill of the weaver who created it. The carpet has an awe inspiring three tiered border. 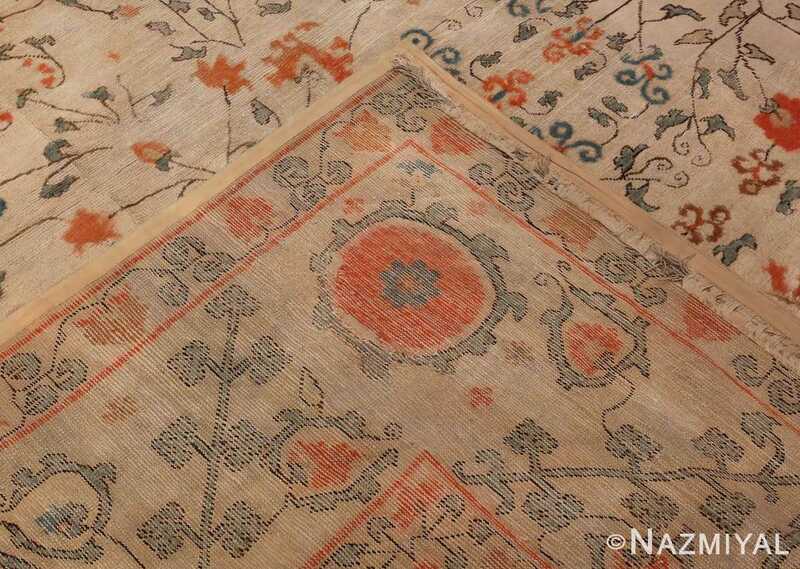 This border beautifully encases the main field of this remarkable large oversized antique Khotan carpet. It also incorporated the colors and patterns that we see in the field, which contributes to the overall and remarkable feel of balance. 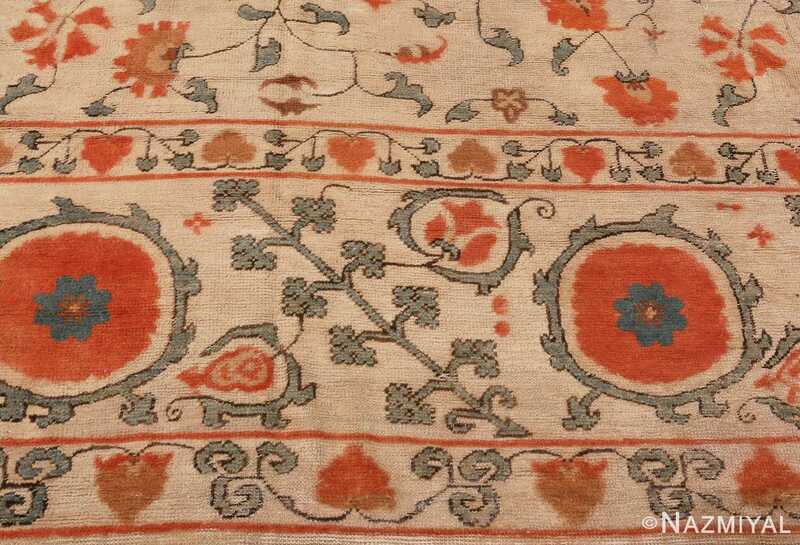 The best word to describe this antique rug would have to be transitional. The reason is that it could work effortlessly in almost any interior design approach and aesthetic. One could place beautiful works by the most famous mid century modern designers just as easily as they incorporate it within more classic and even Scandinavian design. 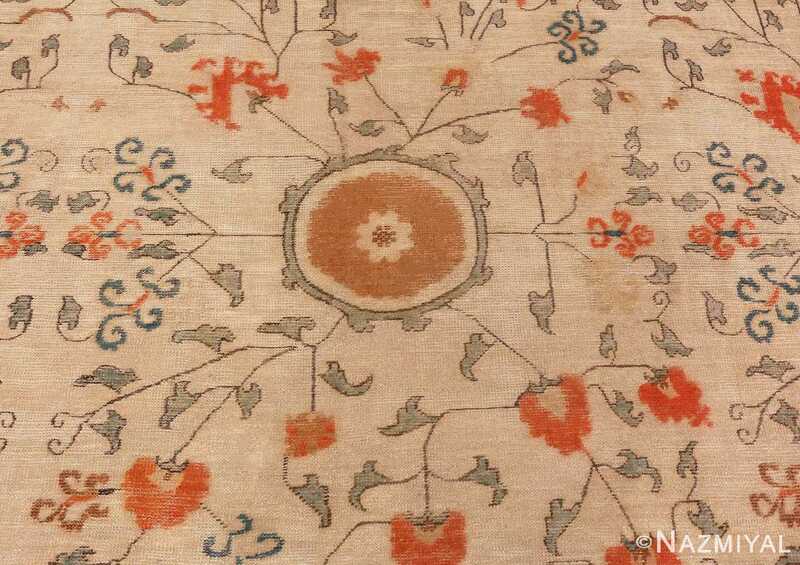 Regardless of how you chose to incorporate this piece, it is the kind of antique Khotan rug that will brighten up any space and is sure to be source of inspiration and joy of generations to come. Rows of lobed Turkoman medallions or 'guls' repeat in symmetry across the soft tan field background color of the above East Turkestan antique Khotan long and narrow size carpet .